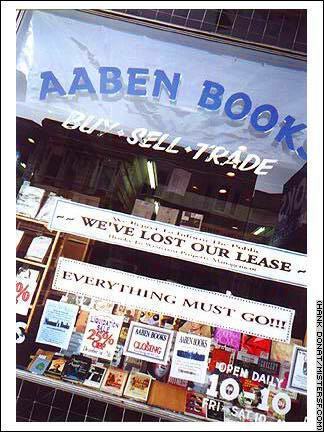 1546 California Street Aaben Books was a favorite in the neighborhood of California and Larkin Streets for the better part of a decade. Neighbors defied themselves to pass in front of the shop without stopping to see which art book, Socialist manifesto, obscure novel, or film noir guide was on display here. The friendly, knowledgeable staff and resident pussycats were just icing on the cake for this quintessential independent bookstore. Rizzoli, 117 Post Street, became a bookstore casualty in 2002, as did 9th Avenue Books and Bernal Books.